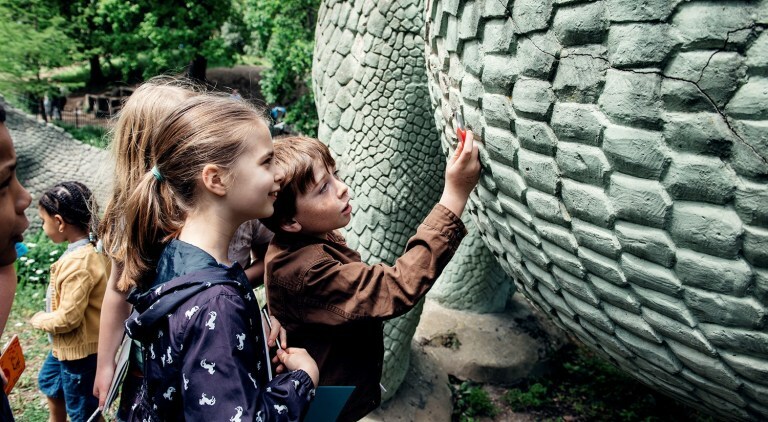 Friends of Crystal Palace Dinosaurs have as their primary mission support for the conservation of the statues and their site within Crystal Palace Park. The Crystal Palace Dinosaurs are world famous heritage assets. Dating from the 1850s, they are listed “Grade 1” on Historic England’s National Register of Heritage Monuments. This is their highest rating. Maintaining this display of over 30 large outdoor sculptures and numerous geological formations is an enormous task. To conservation professionals, the Canadian Conservation Institute’s framework of Ten Agents of Deterioration is a familiar and well-established way of describing risk factors to cultural heritage. This paper, written by past and present FCPD Board members, describes an attempt to translate this framework into a short animated film (below) about risks to outdoor sculpture, using the Crystal Palace Dinosaurs as the stage for the message. The film is aimed at a broad audience of non-professionals of all ages and it is hoped that it will deliver an increased sense of both understanding and ownership of the sculpture park. Major conservation work was last completed in 2003 by the Morton Partnership as part of a £3.6 million Park restoration programme headed by London Borough of Bromley, with contributions from the Heritage Lottery Fund and the Crystal Palace Partnership (SRB funding) scheme. This work involved repair and restoration. It also produced several reconstructions. The conservation work in 2003 needed to be extensive and particular credit goes to geologist Professor Peter Doyle for his contributions. When work commenced most of the Geological Illustrations were unrecognisable. Six of the sculptures were missing, as was a large section of the former limestone cliff with a reconstructed lead mine that was blown up to allow for re-landscaping in the 1962 when the adjacent stadium was built. However, a decade later all the sculptures displayed visible deterioration when viewed up close, including cracks in their bodies, loss of toes, teeth and tails, shedding paint and vegetation taking root on their surfaces. In 2014, Friends of Crystal Palace Dinosaurs led experts from English Heritage around the site to show them areas of key concern. Afterwards, English Heritage designated the site as “vulnerable” and “declining” in condition. This was a call to action. The statues are in trouble, and Friends and the London Borough of Bromley are working hard to save the dinosaurs. In 2014 Bromley Council and the Mayor of London designated an overall £2.4 million for projects in Crystal Palace Park. A public consultation showed the Dinosaurs to be the people’s top choice. £400,000 was earmarked for Dinosaur-related work, including infrastructure, interpretation and conservation. The first phase of conservation work on the standing iguanodon was completed in early 2016. Under the oversight of the Morton Partnership, Cliveden Conservation undertook emergency repairs to stabilise the famous sculpture. This model was chosen as it was in particularly poor condition with several large cracks though its body. The second phase of work began in autumn 2016 and seven of the water-based sculptures have undergone major conservation by Skillington Workshop. Funding is currently available for about 10% of the conservation work required. The remainder will be raised though fundraising. Public pride and a sense of ownership for the sculptures is critical to provide the momentum for future maintenance of the ensemble. The Friends are working with Bromley, Cliveden, Morton, Skillington Workshop and both the UCL Institute of Archaeology and City and Guilds conservation programmes to offer a full set of conservation engagement activities. We are organising site visits during the work, film and photo documentation, and education units for schools (to be delivered through our collaboration with Emerald Ant). Our blog features regular posts about details of the works, while our Facebook page and Twitter account will give topical updates. Stay with us throughout, share us with your friends, and give us your feedback! Multi-award winning documentary film maker Tal Amiran made a short video featuring conservation work done over the winter of 2016-17 on eight of the water-based sculptures. The conservators speak about their work, their feelings for the sculptures and the magical sense of the site. This lovely Pathé video also shows restoration work taking place on the sculptures back in 1959, highlighting the continuing, long-term need for their care and conservation. We’re building the dino bridge! £30,000 Funding Boost brings South London’s own ‘Jurassic Park’ one step closer!